What are Compression Stockings ? Compression stockings and socks are specialized socks/hose designed to increase blood flow through the vascular system of lower limbs. Their main therapeutic purpose is to provide graduated, controlled pressure - beginning at the ankle and gradually increasing throughout the length of the garment - to alleviate circulatory problems such as edema, phlebitis and thrombosis. 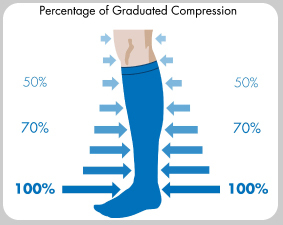 Unlike traditional dress or athletic stockings and socks, compression stockings are specially knit to provide pressure on the legs, ankles and feet, preventing the back flow of blood. By compressing the superficial veins at the surface along with arteries and muscles, the circulating blood is forced through narrower circulatory channels, causing more blood to return to the heart and less blood to pool in the feet. Problems that occur because a valve is no longer closing properly. Blood flows backwards into the vein, creating pressure on the valves below. Pooling can occur in a damaged vein, causing swelling and enlarged veins. In the superficial veins (closest to the surface), high pressure from back-up of blood flow can cause veins to enlarge and twist. At this point, the valves no longer close correctly. In serious cases when blood cells stick near a valve, it is possible for a clot to form. 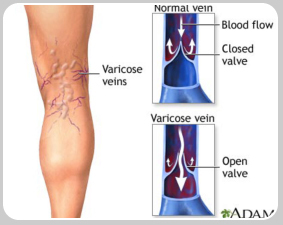 The danger lies in that a part of the DVT can break loose and lodge in the lungs, also causing long term problems in the veins of the leg. Because slow-moving or pporly flowing blood is more likely to clot, some physicians may indicate compression therapy even in the event of a DVT. Arteries carry blood from the heart to the body’s tissues. Veins return blood back to your heart. Inside Veins, valves open to allow blood to flow back toward the heart, then close to prevent the blood from flowing backwards, towards your feet. The Valves keep the flow of blood throughout the veins moving in one direction. Costs of Compression stockings can vary depending on brand, style, strength, and provider. A Certified Fitter with training and expertise in Measuring and fitting Compression garments may carry brands/styles that are Medically effective, durable and precisely fit. These products may differ from Brands/Styles sold in the drugstores or by HME retailers - be sure that your fitter is Certified and trained to Measure and order you a compression garment. Medical Compression stockings are, in most cases, a benefit with extended health care plans and can be reimbursed with the proper documentation. Great West Life – Prescribed by an M.D/ Maximum 4 pairs per calendar year. Manulife Financial – Prescribed by M.D/ Maximum 4 pairs per calendar year. Sunlife – Prescribed by M.D/ Maximum 2 pairs per calendar year.